Add some excitement to your holiday and come along on an exhilarating glacier hike on top of an outlet glacier of Vatnajökull, Europe's largest glacier. This exciting tour is perfect for those travelling the south coast of Iceland and want to combine incredible landscapes with a thrilling adventure. A stop at Skaftafell is a must for travellers on Iceland’s south shore. It is a stunning area of amazing contrasting scenery; where enormous white glaciers are surrounded by jet black sands. Scaling one of those glaciers is a once-in-a-lifetime opportunity that should not be missed, and this tour will allow you to hike up a glacier tongue of the largest glaciers in Europe. You will meet your certified glacier guide by the company's trailer 150 meters south of the Skaftafell Visitor Center. They will give you all the necessary equipment and then take you on a short 15-minute drive to the glacier tongue, where you will receive all the equipment and knowledge necessary to scale the massive ice cap. You’ll learn the basics of glacier hiking before heading out on the ice. 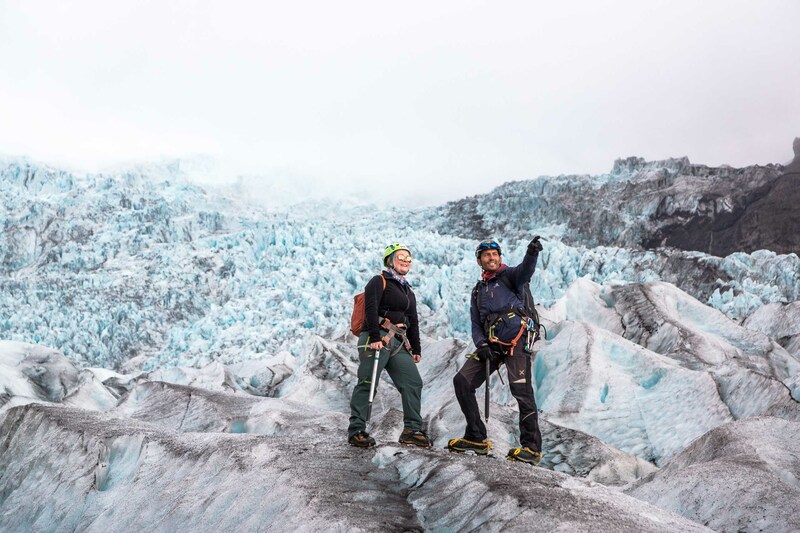 On this tour, you will be given the unique opportunity to hike up a glacier and see firsthand it's constantly changing environment. Your expert guide will lead you through this frosty wilderness, past incredible ice formations, deep cracks and blue crevasses. Standing on top of the glacier might give you a feeling of being alone in the world, surrounded by nothing other than the blinding whiteness of the glacier. Once you reach the ice cap, you’ll get plenty of time to marvel at the surrounding landscape and take in the views. During this tour, on a clear day, you might see the magnificent Hvannadalshnúkur, the country’s highest peak. Discover the ancient and untouched wilderness of Vatnajökull glacier surrounding areas. Book now to secure your place on this unforgettable glacier hiking tour. Check availability by choosing a date. Departure time : 09:00, 10:00, 11:00, 13:00, 14:00, 15:00. - This tour doesn't require prior experience. - It is 3 hours in total including gearing up and bus ride to the glacier. Around 1,5 hours on the ice. - Hiking boots should be tight around the ankle and have a hard sole. You can rent shoes during the booking process. - Skaftafell is located around 4 hours and 30 minutes from Reykjavík 327km (203 miles). The nearest towns to Skaftafell are Kirkjubæjarklaustur, 69km to the west and Höfn, 130km to the east. - The meeting point is by the company's trailer 150 meters South from Skaftafell Visitor Center. You need to be at the meeting point 30 minutes before the departure time of the tour. - From May 1st, the meeting point will be at Skaftafell Terminal Tour Center by the main road. It was very cold, especially when it started hailing on the glacier! I would definitely reccommend wearing lots of layers! Our tour guide was lovely, very knowledgeable and I felt safe whilst I was on the glacier. Definitely worth it for the views and experience! Our tour is very interesting. Our tour guide Jessica brought us to see one of the ice cave nearby while hiking up the glacier and explained to us a lot regarding the glacier. She even help each of us to take picture in the ice cave. Btw it is quite a long walk to the glacier, so bring the necessaries only for this tour. Super hike around a beautiful glacier with a great guide. Had a great experience. Thank you very much. Everything was perfect. In fact, the glacier hike was the most amazing experience in Iceland to me. I wish it could last longer than 3 hours. My favorite Iceland pictures were taken by our guide, Ryan. Thanks for making my vacation awesome! Our guide Jessica was great!! Always patiently showing us how to safely move on the ice and taking photos for us like a pro. It was well paced and was very informative. The tour was definitely one of the highlights of our trip in Iceland! It was a great tour and we had a unique experience on the glacier! The guide was very friendly, funny, fluent in English and was taking care of us in a perfect way. We always felt safe and thus, enjoyed the tour very much. I can absolutely recommend it and I am glad we decided to join. It was amazing! Such a exciting and pleasant experience. Our guide was really informative and helpful. Super safe and never felt any danger. The best day of my trip of Iceland! I would definitely recommend this. As having some experience with hiking, but not with crampons, I found this hike to be easy. The guide was very nice and the views were beautiful. This is definitely an experience I recommend! The views are amazing of both the glacier and the surrounding area! Our guide Maggie was fantastic! She was extremely knowledgeable and friendly! I highly recommend this! One of the biggest highlights of my trip to Iceland. Our guide was very knowledgable and made sure the difficulty level is suitable for the group. We spent enough time on the glacier and sure we all learned a lot. Very inspiring experience. This was a great experience. Our guide was excellent and we spent a lot of time on the glacier itself. I would highly recommend this tour since it felt like one of those "once in a lifetime" experiences. Both my husband and I enjoyed the tour. Our guide Lisa was very patient and nice. A few tourists in our group kept Lisa busy with millions of questions (as if this is their private tour), which made us make longer stops than needed. Lisa was gracious and didn't shorten the trip. We completed the walk at 3.5 hours. Thanks for giving us a great memory of Iceland! Great tour. Good safety instructions, felt safe at all times, very friendly, a very decent amount of time spent on the ice. Very manageable for all of our group. Awesome tour. The hiking intensity level was perfect for the average person. The guide was from local, funny and informative. Highly recommended! Excellent excursion! We could tell that our guide loved his job, and he made our tour a lot of fun! We had a great time on this hike, and felt it was a great value for the price. Extremely reasonable price and you get to see incredible sights and enjoy a walk on a beautiful glacier. Our guide, Ryan, was so enthusiastic and passionate. He did such a great job making sure we were all on track and felt confident with the walk. He had fun stories to tell and activities planned along the way. The level of difficulty was pretty easy and we all felt like we could have gone a little longer and would have liked to go higher up, but also felt that it was totally reasonable for what we paid for. This is great for if you want to get an intro to glacier walking, see the glacier up close and get some good pictures, but still have time to do other activities in the same day. It worked out perfectly to do this hike in the morning and then go to the Glacier Lagoon afterwards. Great experience and great company. It was easy to find the check-in location, and we were fitted properly for our equipment. We got bused to the glacier and were split up into smaller groups. The full 3 hours was perfect for being out on the glacier and seeing the area. We had 7 people we were traveling with, and we ended up being with our own tour guide. The guide was fantastic and had a background in landscape photography so he took us to great photo spots. I'd recommend earlier tours because there are other tours and hikes going on around the glacier. We went at 9am, and there weren't many people out. Good boots are recommended. The hike really wasn't that challenging- the crampons are really helpful. We took frequent breaks to catch our breath while our guide talked about the glacier. Highly recommend!! Fantastic trip. Only spoiled by other tourists who were unprepared and would not listen to the guide. This is not suitable for those who are unfit as it is fairly strenuous. The views were incredible and this was a definite highlight in a trip full of breathtaking, incredible adventures. You do need sturdy over ankle boots but you can rent these if you do not have them. Our guide was Vincento and he was excellent - very knowledgeable and kept everyone safe on the Glacier. This was an amazing vacation. Guide to Iceland made booking everything so easy, hotel, cars and activities all at once! The car, hotel and tour guides were wonderful. The planned itinerary was great it really helped guide you through Iceland, without having analysis paralysis about choosing what sites to pick! The staff were polite and helpful and answered all of my questions promptly! We just wish we could stay longer to see more! I would recommend Guide to Iceland to anyone thinking of visiting Iceland. I hope to come back again! Our family of four had a grea time on our Glacier hike, even if it was raining! David was a terrific guide and was very informative. It was definitely the highlight of our trip. He was very safety conscious and didn't rush anyone. He did some special activities with the kids as well. it was a great experience all around. Its a must do! It was an awesome experience for me and my family. We really enjoy the hike and the experienced guide. The view on the glacier was amazing and the hike itself was unlike any hikes I have done in regular mountains. Highly recommended! Unforgettable experience .one of the best and if you are in Iceland you should do glacier walk. Our guide from troll expedition was experienced and knowledgeable. Overall it was a memorial experience. Great tour. The guides were very knowledgeable and we had lots of time on the glacier itself. Wonderful experience for the whole family. Lots of time on the ice and a knowledgeable guide. The tour was very knowledgable and fun! Our guide Hinrik surprised us that he speaks Mandarin and Taiwanese! I didn't expect to have a Chinese speaking Icelander tour guide. It was kinda funny. :D He explained safety rules and instructed us how to use ice cleats and ice axes very carefully. I had so much fun! The hike was impressive and the views that we had were incredible. Our guide put a lot of attention to the safety, both with the proper use of the equipment and with the behaviour on the glacier. He also provided a lot of information about the glacier itself and how it changes over time. As this is the most dangerous place in Iceland to visit (according to our guide and I agree) I advice anyone to make sure it will be safe. Troll takes good care of that. I have seen some other companies does not provide helmets for the visitors. For the nominal case it is not needed but considering extreme scenario of falling into a crevice, my personal preference would be to have a helmet on. I highly recommend Troll. This was an incredible tour! Shout out to our guide Sigurpall for great conversation and showing us the great views in this dynamic environment! Brilliant - a highlight of our trip. The glacier was spectacular - the weather was perfect & our guide Agnes was great. I would highly recommend Troll Expeditions. An absolutely amazing and unique experience! The staff was very kind and helpful. We saw so many gorgeous views and our guide made sure to stop in plenty of places so we all got great shots. Interesting facts about the glacier, it's formation, it's deterioration, it's wonders, and dangers were given throughout the hike from our very knowledgeable and interactive guide, so we not only left with great photos, but also having learned a lot! We even got a taste of the ice! Awesome tour and the hike was not difficult at all. Recommend to all. This tour was amazing!! Our tour guide Agnes was awesome and we would totally do this tour again! The tour was an amazing experience! I will never forget this adventure and loved every part of it. Our guide , Lidia was so helpful and nice during the whole tour and we all had such a good time! This was such a good tour! Our guide María was really helpful and we felt safe during the whole trip. It was even better then I could've hoped for and we were all really glad to have booked the tour! Lydia was our very informative, friendly guide. We really enjoyed our hike! It’s well worth the price and Lydia took some great photos of us. The view from the top was breathtaking! I would love to do it again! Had a great time on this tour with Lidia as our guide. Highly recommend if you ever go to the east of Iceland. The scenery here is so breathtaking and you won't regret doing this. Definitely worth the money! First time to hike on glacier. The guide seems knowledgeable. Very unique experience, being a fan of intersteller should not miss this. Wear a bit lightly if you come in May. I got ski outfit, got sweaty during walking as it is a sunny day. This tour was so beautiful and invigorating. I felt safe with our guide Agnes, she was very knowledgeable and funny. She even sang us a folk song on the glacier! I had never been on a glacier before and thought it would be a fun experience. I'm so glad I booked the tour with Troll Expeditions, our guide was Lydia, she made the whole trip so fun and energetic! I really recommend this tour! This was such an amazing experience. Aggie led us on such an informative hike up the glacier. It was an otherworldly experience that I will never shake. Our tour guide even performed the Icelandic rally song in honor of the National soccer teams victory over England and upcoming appearance in the World Cup! My friend and I had an amazing time on the Glacier thanks to this tour. The staff members were very kind and available to meet our needs. Our guide Siggi trained us about how to hike on the ice and constantly took care of our safety during the tour. We visited stunning spots and get incredible shots during this short adventure. This low difficulty hike is absolutely recommended to everyone. We had a lot of fun and it was so impressive to walk on such a massive glacier. I would not say this was "medium difficulty" - we found it to be a very easy and slow walk. But we enjoyed learning about the glacier and it was certainly a once in a lifetime experience. This hike was amazing! Our tour guide Agnes was wonderful and knowledgeable. She was also certified to take us into the ice caves and at no extra cost! The hike was pretty easy and the view was beautiful. Agnes also taught us a lot of Icelandic history in general as well as geological aspects of glaciers. I highly recommend doing this tour. The rest of the staff was really fun and helpful in getting ready for the tour. It was a really great and unforgettable experience!! Wonderful tour & experience with the Troll staff! Breathtaking views and exciting glacier walk. LYDIA is just so wonderful! Truly loves every minute she’s out on the glacier & it translates into her tours. Her patience & kindness was just the cherry on top. Can’t wait to go back to Skaftafell!! Incredible experience, this hike had amazing views of he glacier, lots of greats spots for pictures. We got to see "The Wall" from Game of Thrones and where a few scenes from the movie "Interstellar" were filmed. Our guide Lydia was great! very knowledgeable of the area and super nice. All in all great activity and must add that I always felt safe during the trip. The glacier hiking was amazing. Our tour guide Michael is a cautious, supported and patient person. The glacier hiking is not physically demanding, we really enjoyed the trip! Highly recommend this trip and Michael! The glacier hike was amazing. Michael was our tour guide and he did fantastic. We felt safe, secure, and supported. The views were indiscribable! The tour is 100% worth every dollar. We had a group of four and we all felt very pleased. Great time and adventure! Great tour! informational, but didn't spend the whole time talking. Very good tour! Our guides were very friendly and we did exciting things on the glacier. Amazing experience. I still haven't fully taken in the fact that I've walked on a glacier!! We were very lucky to have a nice sunny day for the tour. safety equipment was distributed at the car park and we were shown how to correctly put on crampons once we arrived at the entrance to the glacier. The hiking was fun and the view was truly stunning. Our guide was fun, friendly, patient and passionate, really admire his love for nature. If you travel to the south coast I would highly recommend a glacier hiking tour if you could - in the winter the weather can be very unpredictable in Iceland. It might be perfectly nice now but stormy the next minute. Road conditions also change minute by minute. So if you have a good day during your stay, head to the glacier!! The guider is very nice, very patient and careful. We hike in a group of 12 Chinese visitors, so maybe a little boring for the guider since we cannot communicate very well... It is not stressful as I thought, but much fun. The glacier hike was a highlight of our trip! The view from the glacier is so unique. Our tour guide Mike was also great! Our guide Sigga was informative and friendly. There was a photographer following our group and he had taken some group photos. I'm wondering whether we could get any of the photos? I'd highly recommend this glacier hike in small group. I absolutely loved the glacier tour with our guide Oddur from Tröll Expeditions! He was a super fun guy with a lot of knowledge about the glacier as well. It was a breathtaking experience and, in my opinion, going on a glacier is a must do when in Iceland! Incredible! You could feel that our guide Oddur, truly and always loves to go out on that glacier. It didn't feel like we were just following someone, we were actually hiking together! He had a very keen eye on our safety and was able to keep it without spoiling the experience, which was especially amazing when we got to climb! 5/5, would rappel with you anytime again! Our experience with Tröll expeditions, which is the tour operator that Guide to Iceland set us up with, was excellent! They were able to accommodate us at the last minute at no extra charge when we realized we booked the wrong glacier to hike and needed to go to a closer one. The hike itself was amazing and one of the highlights of our trip! Our tour was amazing. Our guide Siga was excellent. It was a fun and informative hike: Siga knew so much about the country, the glaciers, and the particular glacier we were on. She made the experience above and beyond what we've expected. The only reason I'm giving 4 stars is due to communication issues between Troll expeditions and the group. There was a storm on the day we were supposed to go for the hike; all tours were canceled due to storm, which is understandable, but we did not receive any information about the cancellation until after we've arrived at the meeting point. I got an email about the cancellation about 30 minutes before the tour was scheduled to begin. The information van at the meeting point had no information posted. We had to pay for parking and pay for calling Troll expeditions to reschedule the tour. We rescheduled for the next day, and when we arrived, there was nobody at the location. Turned out, the tours were running late, due to that same storm, which again is understandable, but wasn't communicated to us early enough and we had to call again. Overall, with improved communication, the tour would be an absolute must: really, all it takes is posting a note in the van window. It was the best sightseeing we've done in Iceland and we have hiked Skógafoss falls! Troll expeditions was GREAT. We had the coolest tour guide. Not only was it fun, but very informative. We had much more protective gear than the other groups we saw and this made me feel safe! Through Troll, it is a much smaller group - that way much more intimate of an experience. We have NO regrets choosing Troll. AND it's the cheaper alternative. I truly think you get more out of your experience through Troll. Thank you! Excellent tour. Trim our guide from Troll expiditions was very knowledgeable and fun to talk to. Would definately recommend! Also, troll expiditions looked to be one of the few companies offering adequate protection gear, we saw guides taking people on the ice without helmets, one wrong footing and you could fall and smash your head. great company. Our tour was amazing. Mike was very knowledgeable in the terrain and science of glaciers. It was a very great experience. Svínafellsjökull glacier is truly amazing, and the Troll expedition guide Bright is very friendly and knowledgable , great experience in Iceland, highly recommend. Great. I highly recommend Troll expedition as they seem to be a smaller outfit and is more personable. Sigga was our guide and she is really nice and easy-going. The only criticism I have with this Skatefell Glacier hike tour is that the glacier is melting really fast and it doesn't look at pristine and grandiose - maybe my expectation is too high as we have to drive 4 hours from Reykjavik to get there (1-way), worked out to be 8+ hours of driving. Knowing what I know, I might have gone to the closer glacier hike at Solheimajokull. Great tour! Our guide mike was super friendly and knowledgable and the scenery is unbelievable! Troll is a smaller group, so its a more intimate experience. The guide gives you options and lets you decide what you want to see/do. This was totally worth it! We had a great, memorable time! Fantastic tour! The guides were very funny and took us to parts of the glacier that other tour groups do not go. We also got to do some repelling along the glacier because the weather was so nice! I highly recommend going with Troll Expeditions as they are a smaller company and you are more likely to get a private tour as we did! It was just our family on the tour! The glacier hike in Skaftafell is very very good. Our guide was so professional and knowledgeable. We enjoyed the hike and the landscape around the glacier - I can't describe it, it was so beautiful! We would recommend this hike to everybody - it is worth it! Phenomenal tour. Bjartur, our guide, was amazing. I would highly recommend booking this tour for family and friends, we went at 9am with perfect weather and the best tour guide of the glacier, Bjartur! He explained the different facts and tidbits of the glacier which was very entertaining. We visited lots of different places but always in a secure environment. Glad we booked it!!! Meeting our guides in Skaftafell was an simple task, we were swiftly put in our gear and got on the glacier via Troll Shuttle that they have to make our lives easier. This level of hiking suits everyone but the landscapes and formations on glacier is something out of this world and is no surprise that this has been the set of many movies both Hollywood and Bollywood. Guides continued teaching us about safety and how not to take selfies when walking :) This tour is an absolute for anyone that has adventure in the heard and the courage to stand on the icy ridges over crevasses. A special hike in a special environment. bjartur our guide really knows his craft. He took us to the glacier for a 3 hours walk which was perfect. Preferred a free and easy holiday but decided to book a hiking tour due to the limited time I have here in Iceland. And I must say it has met way beyond my expectation! Our guide, Sigga was amazing and really friendly! She was very chatty and funny and made sure all of us enjoyed ourselves. This was breathtaking! Amazing glacier! Amazing guide! Amazing nature! Amazing view! Amazing company! I highly recommend this glacier hike, it gives you a beautiful view and our guide was very friendly. This is one of the best trips I have ever been in. Thank you. This is the highlight of my trip in Iceland. This glacier is so beautiful and the nature around it. Thanks to our glacier guide, this hike is something that I will never forget. Thank you Trolls. The glacier hike was crazy! I have never done anything like this before. The glacier guide was so good at his job and so knowledgeable. This place is the most stunning place I have ever seen. Thank you for making my trip to Iceland unforgettable! Great hike, Mike was a great guide. Really fun experience to hike up the glacier. When I booked this trip, I had no idea what I was going into. I had never been on a glacier before so I was a little bit scared but thanks to the professional guides at Trolls, I felt really safe on the ice. They did an amazing job and the view at the glacier is something that you will never forget. Highly HIGHLY recommend this trip to everyone! Skaftafell is one of the most beautiful places in Iceland. Going on the glacier was amazing experience. A really big thank you to Troll Expeditions! Great hiking tour with Mike. He is so much fun. Great tour with great people, we got a tour with Bjartur. Skaftafell is a great place to do a glacier hike the nature there is unique and it was so much fun to go on this tour. Skaftafell is a great place to go on a hike. The nature there is really special and the glacier is amazing. I choose Troll Expeditions after looking through their tours. The guide Sigga, was a really fun. The tour was great and she made it better with her knowledge. Palli our guide took us from the Skaftafell national park to the glacier. The hike took about 3 hours which was good for an average fit person like me. This is the biggest glacier in Europe so we only covered a small portion of it. This was in all very well planned and the duration and difficulty was perfect. Thank you for an awesome tour. Our guide Mike was the best. His enthusiasm and knowledge made the hike spectacular. The only recommendation I would make is to stay in the area either the night before or after the hike. We drove from Reykjavik and back after the hike and it was over 9 hours of driving in one day. This glacier hike is breathtaking! The ice and the nature, I can't even describe it, it's so beautiful! Our guide was so nice and knowledgeable. I had amazing time at the glacier. Thank you Troll Expeditions for the best trip ever!